This edition helps students establish and build upon practical skills with engaging examples and numerous skill-building and application exercises in every chapter. Using a streamlined format, this edition takes a close look at how change demands innovation and how innovation requires forward-thinking, flexible leaders and organizations. 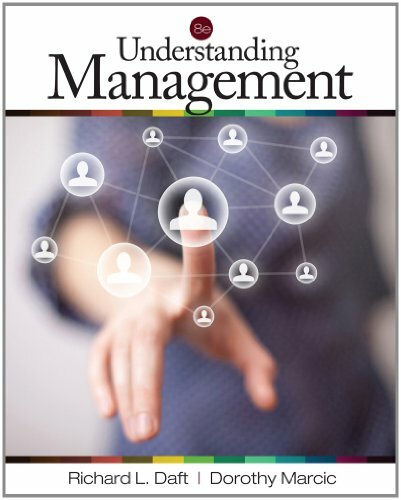 With the book's complete ancillary package, UNDERSTANDING MANAGEMENT, 8E provides everything needed to prepare future managers to seize business opportunities and lead change. Be sure to also investigate the menu of high impact digital options available with this edition, including Aplia and CengageNOW. chapters and has published in the ADMINISTRATIVE SCIENCE QUARTERLY, ACADEMY OF MANAGEMENT JOURNAL, ACADEMY OF MANAGEMENT REVIEW, STRATEGIC MANAGEMENT JOURNAL, JOURNAL OF MANAGEMENT, ACCOUNTING ORGANIZATIONS AND SOCIETY, MANAGEMENT SCIENCE, MIS QUARTERLY, and ORGANIZATIONAL BEHAVIOR TEACHING REVIEW. Dr. Daft has received several government research grants in organization design, organizational innovation and change, strategy implementation, and organizational information processing. An active teacher and respected consultant, Dr. Daft has served as associate dean and helped manage a start-up enterprise. He has been involved in management development and consulting for numerous organizations, including the American Banking Association, AutoZone, Nortel, Bridgestone, TVA, Pratt & Whitney, Allstate Insurance, State Farm Insurance, the United States Air Force, the U.S. Army, J. C. Bradford & Co., Central Parking System, USAA, Bristol-Myers Squibb, Vanderbilt University Medical Center, and many others. Israel, and the London School of Economics. She has served on the boards of the Organizational Teaching Society, the Health Administration Section of the American Public Health Association, and the Journal of Applied Business Research. Dr. Marcic has authored 12 books, including Organizational Behavior: Experiences and Cases, (South-Western Publishing, 6th Edition, 2001), Management International (West Publishing, 1984), Women and Men in Organizations (George Washington University, 1984), and Managing with the Wisdom of Love: Uncovering the Virtue in People and Organizations (Jossey-Bass, 1997), which was rated one of the top ten business books of 1997 by Management General. In addition, she has had dozens of articles printed in publications such as Journal of Management Development, International Quarterly of Community Health Education, Psychological Reports, and Executive Development. Professor Marcic has conducted hundreds of seminars on various business topics and consulted for executives at AT&T Bell Labs, the governor and cabinet of North Dakota, the United States Air Force, Slovak Management Association, Eurotel Czech Ministry of Finance, the Cattaraugus Center, USAA Insurance, State Farm Insurance, and the Salt River-Pima Indian Tribe in Arizona.